Become the Ultimate Raceroony Champion by snatching up valuable landmarks while racing around Prince Edward Island. The landmarks are historic and are also worth points. So the more you get the better you’ll do, but be careful, because everyone else is trying to take them from you. The more you play the smarter you get, not only in strategy but also in geography. The board is a map of PEI, complete with coastal towns and historic highlights. We know you’ll enjoy playing this game and discovering Prince Edward Island along the way. The game play is a cross between Monopoly and Risk. You have to collect landmarks which are worth points but you also have to defend them from other players who might try to take them from you. The game includes one gameboard, six pawns, one dice, a set of instructions and a deck of landmark cards. Each landmark card tells a different story of the area. The game board measures approximately 20x15 inches in diameter and the box is approximately 10x15x2 inches. 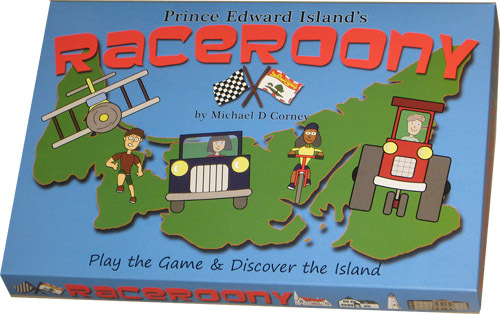 Raceroony was designed and produced by Michael Corney who was born and currently resides in Prince Edward Island. Over 450 people are playing Raceroony. Here is what some of them are saying. "This is the most fun I've had with a board game in ages." Peter from Crapaud. How many people can play Raceroony? What are the preferred age groups? Ages 6 and up. If a child can read he/she can play Raceroony and as long as an adult wants to have fun he/she can play as well. Younger kids don't fully get into the strategy but still enjoy moving about the Island while older players have more fun with the strategic elements the game offers. An average game takes 30-45 minutes to play depending on number of players. Is Raceroony a trivia game? No. There are NO trivia questions but each Landmark Card has an interesting story about the area it represents. You will learn a lot of trivia but don't need that knowledge to do well. Is Raceroony a unique game? Yes. Raceroony is an original concept. There are no other games quite like Raceroony, but if you wanted a comparison, one might say it is a cross between Monopoly and Risk with other factors that cannot be compared. We began selling Raceroony in November of 2008. How long did it take to make the game? It took a solid year to go from original concept to implementation. The version you are now playing is basically version 4. We consistently updated our design and game play after testing it on various focus groups. Is Raceroony a true Island product? Yes. We designed, produced and sell this game on PEI. Can I buy Raceroony online? Yes, you can buy the game right here on our site. We accept credit cards through PayPal. To purchase a game click here. If I buy Raceroony online, how long will it take to ship? We ship games within 5 days of an online order, so you should receive your game in less than two weeks.